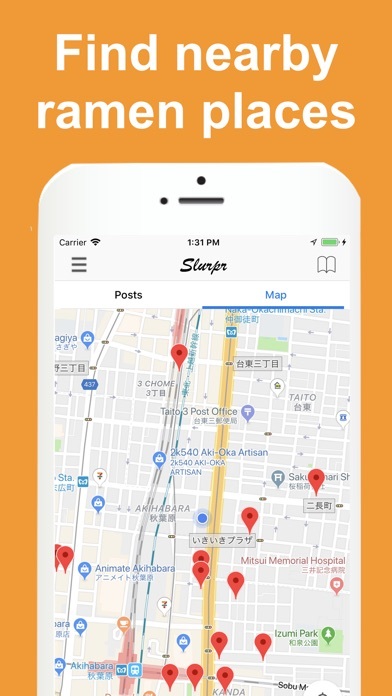 Slurpr is a food finder app which is specialized in ramen. You can find your favorite ramen from ramen experience contents shared by people all over the world. Searching for the ramen you want to eat next. Looking for reputable shops nearby the place where you're not familiar with. Looking for "soy sauce, and light taste ramen“ or "tonkotsu and rich taste ramen" with your today's mood. It is a useful app in such a scene. 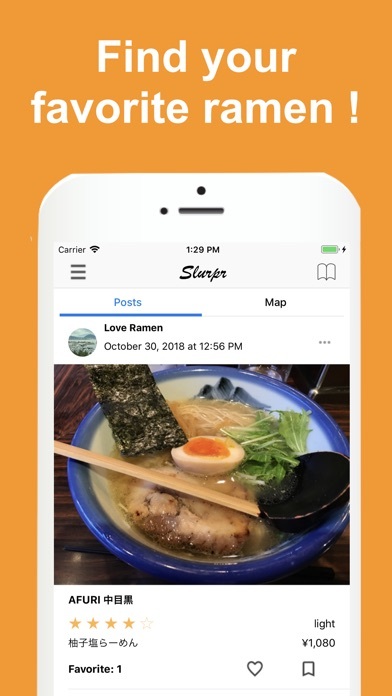 Make your ramen life more fun and fulfilling with Slurpr! What you can do with Slurpr + Information you want to know at a glance! Not only photos of ramen, but also information you want to know such as shop name, menus, ratings, taste types and prices, etc. can be checked at a glance. + Filter by type of ramen! 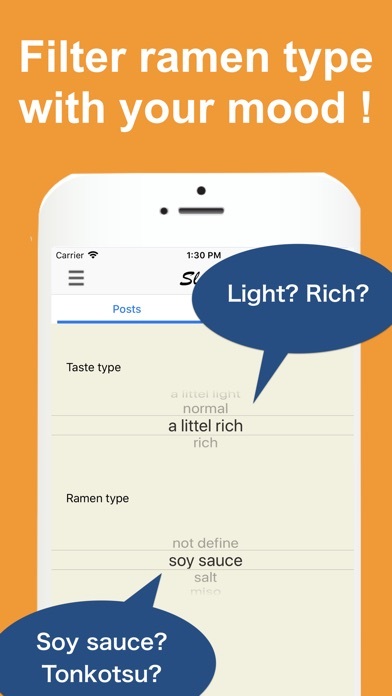 You can filter other users' ramen experiences (posts) by specifying the type of ramen such as light, rich, soy sauce or tonkotsu etc. I can drill down the information of the ramen I want to know now, with the feeling like "want to have salt and light one today". 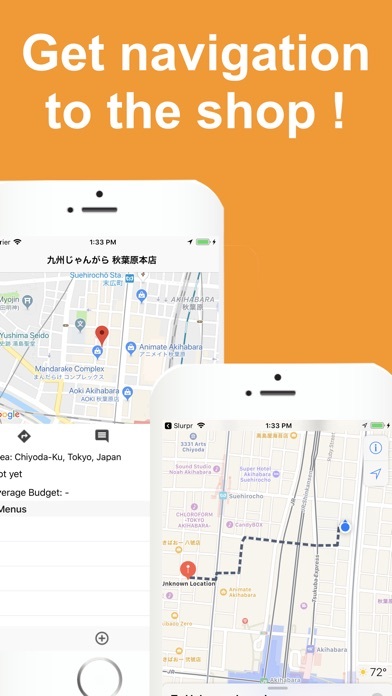 + Find nearby ramen shops! You can search ramen shops near the place you are located or a specific place on the map. By tapping the comment icon at the bottom of the screen, you can check only posts related to the displayed ramen shops. 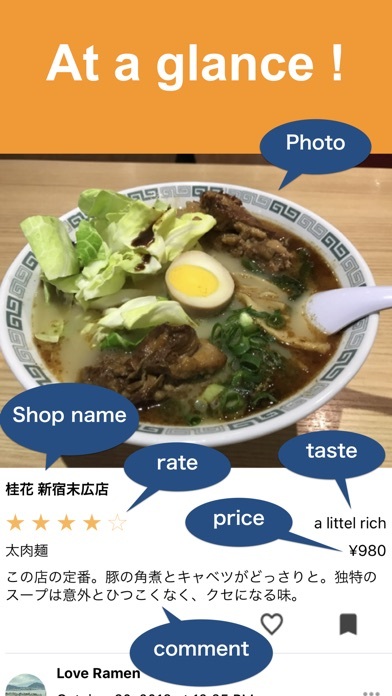 In addition to understanding the location on the map, you can find ramen shops with browsing posts with photos and ratings. On the Posts screen, of course you can filter by types. + Access shop details By tapping the shop name on the Posts screen, you can check the detailed information of the shop. It will be good reference for you to check places, average ratings, budget and see only posts about that shop etc. If you find a shop you like, save it to Bookmark. Navigate to the shop If you find a shop where you want to go, tap the navigation icon. The map app will be launched and showing navigation from the place you are now to the shop. You'll never lose the way even if the shop is your first visit. + Save favorite posts or shops to Bookmark It is convenient to Bookmark when you find posts or shop you like. 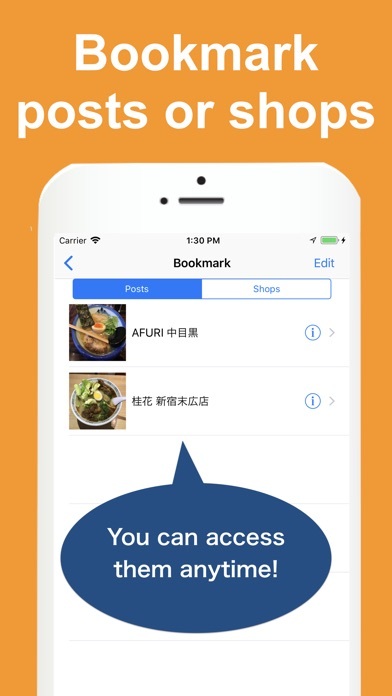 You can access your own bookmarks and retrieve the information at any time. It is also convenient when you check and save shops near the place you will visit in the future in advance. + Post your ramen experiences Let's share your ramen experiences. Your posts will be valuable reference information for other people around the world to look for the next ramen. ※ Contents posted are to the last, personal impressions. We are not responsible for any content. Weitere Apps von TFORT, INC.